Kermadec Islands, volcanic island group in the South Pacific Ocean, northeast of Auckland, New Zealand; they are a dependency of New Zealand. 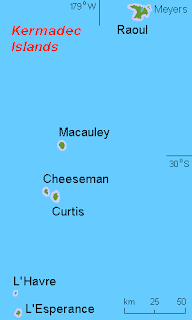 They include Raoul , Macauley, and Curtis islands and l’Esperance Rock and have a total land area of 34 sq km. Raoul, the largest , has rugged coastal cliffs that rise to Mt. Mumukai. It is heavily wooded and fertile, but its indigenous flora and fauna have been adversely affected by the introduction of cats, rats, and goats.Nowadays uninhabited, except for the permanently manned Raoul Island Station, the northernmost outpost of New Zealand. The islands are a volcanic island arc, formed at the convergent boundary where the Pacific Plate subducts under the Indo-Australian Plate.The four main islands are the peaks of volcanoes that rise high enough from the seabed to project above sea level. There are several other volcanoes in the chain that do not reach sea level, but form seamounts with between 65 and 1500 m of water above their peaks. Monowai Seamount, with a depth of 120 m over its peak, is midway between Raoul Island and Tonga.Raoul and Curtis are both active volcanoes. 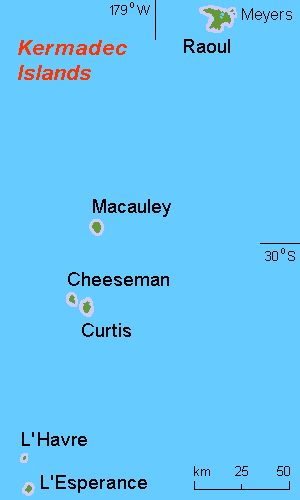 The volcanoes on the other islands are currently inactive, and the smaller islands are the eroded remnants of extinct volcanoes.